Three were the challenges that Gillette had set up for this campaign: to let everyone know about their new Anti-transpiration body spray, to beat a Guinness Record and to generate buzz at a continental scale. To achieve this, we needed to put the whole thing into it, and so we did. Everything was related to a one-of-a-kind sportive event to be broadcasted in streaming. In a first stage, on each day of the week, a fitness influencer from one of the 7 countries involved in the challenge performed her own workout, sharing it on Vine and Instagram, within a parallel competition, conceived as a preheat for the official one, where the audience was motivated with incentives. In this case, instead of push up’s, they needed to gather interactions over the videos to win. The second stage consisted on a wide real-time coverage of the Guinness Record event, live broadcasted in streaming, upon which a massive traffic was driven. 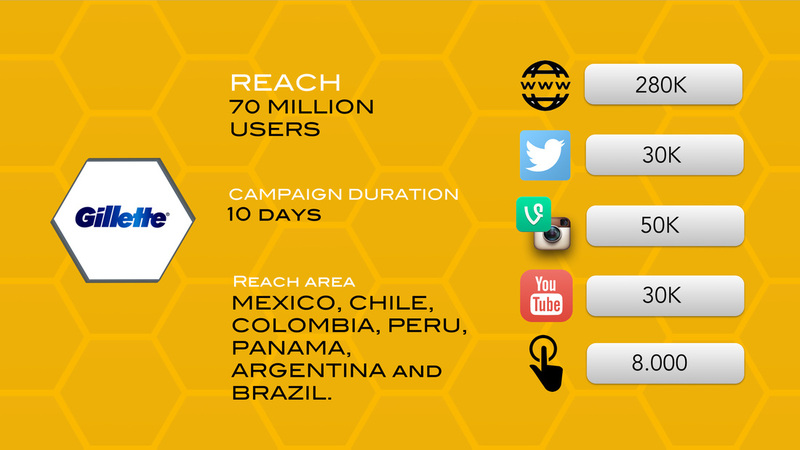 In this phase we took advantage of big sportive media to amplify the reach, like the Futbolfans.com network. Lastly, a recap stage performed by webs&blogs that summarized the campaign and spread the word about the winners, both from the official and the parallel competition.